The mention of Chinese bhel makes my mouth water! I give full credit to whoever came up with this genius idea! Bhel has always been the most popular street food….and by street, I mean streets by the beach, park, hiking trails and picnic spots too. My family still packs bhel when we go to the beach or a picnic here in the summer. Let me attempt to explain bhel to my friends who are not familiar with it. It is a type of savory chaat, made with puffed rice, chivda, finely diced onion, cilantro etc… all combined together with the sweet, hot and tangy chutneys…..I am drooling at the thought now…so I better move on. In my post on Indian Chinese –American Chop Suey, I had told you about how Indian Chinese fusion dishes have become mainstream cuisine in India. Chinese Bhel is one such dish. It starts out with the Chinese technique of stir frying, adding the sauces and then combining it with finely diced spring onion, tomato and cucumber. 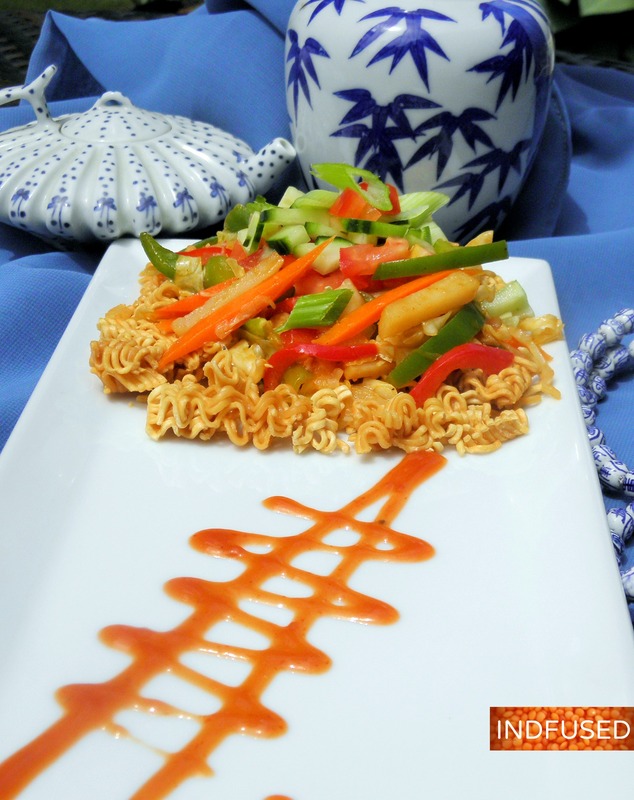 Fried noodles are added to the Chinese bhel. I baked the Ramen noodles, just like I did for the American Chop Suey recipe. I also tried another experiment with regular noodles. I had heard about cooking, draining/drying and then baking the noodles. I have both types of noodles in the photos. But I was not happy with the texture of the boiled and baked noodles. Many years ago in India, I had watched with rapt attention as the food vendor made my Chinese Bhel. After stir frying the veggies, he added soy sauce, tomato sauce and hot sauce individually. I used the same sauce as I did for my American Chop Suey because it has the same ingredients and because we love it so much. 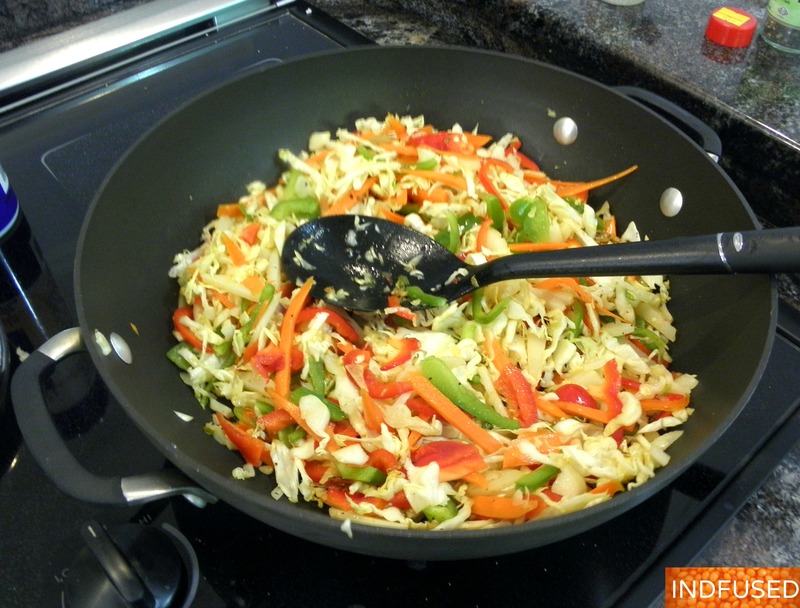 For veggies, cabbage, green pepper and carrots are mainly used in India. I add red pepper and water chestnuts or lotus root…again because we love the taste and crunch they add to the dish. The Chinese Bhel tasted great……now I only wish I could make it with the flourish of that food vendor! His rhythm in making batch after batch of the Chinese bhel was like watching a captivating performance! Heat the sesame oil and add the grated garlic and green chili pepper. Stir and add the sliced veggies and the water chestnut. Add the salt and pepper, stir fry the veggies until they are just tender crisp. Add the sauce, toss to coat and let it cook for a minute or so. Remove from heat. Toss in the baked noodles. Top with the cucumber, tomato and scallion and serve immediately. Enjoy the crispy, crunchy, savory, tangy and spicy Chinese Bhel! Thank you so much! 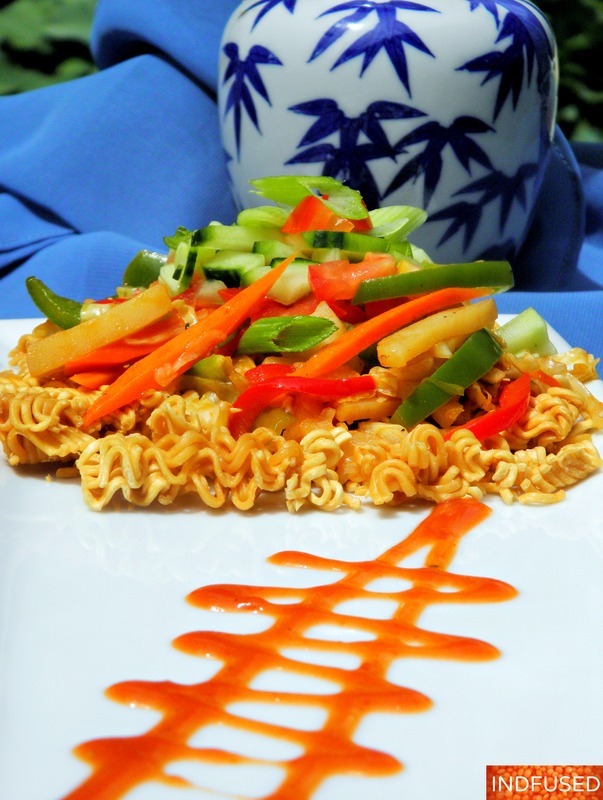 It really is a delicious fusion of Chinese and Indian cuisine. Thank you Nandini! I had first tasted Chinese Bhel about 15 years ago in Pune and am hooked ever since! This looks scrumptious! I like how you demonstrate and make it seem easy to do. I like fried cabbage with sesame seed oil and will try other ingredients. Thank you, Sandhya. Thanks Robin. Do try it. I tasted my first Chinese Bhel more than 15 years ago and was hooked at first bite! You will love it! Chinese bhel is so addictive, isn’t it?